Scoop! 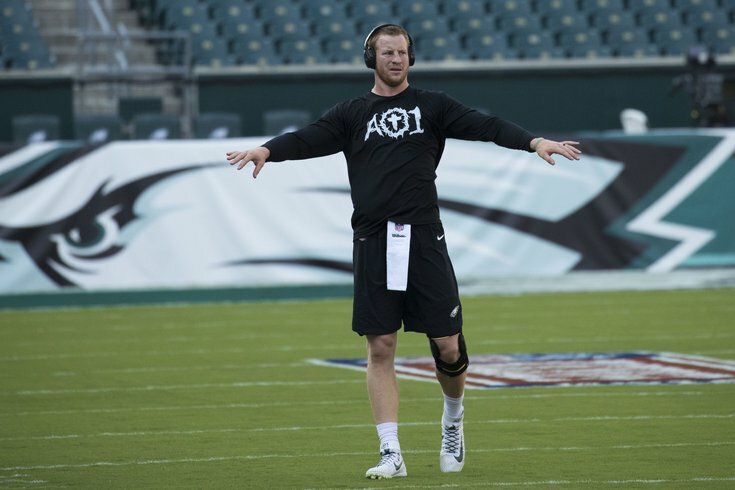 Carson Wentz isn't playing. The Philadelphia Eagles weathered devastating injuries all season long during their run to the Super Bowl last season, and the 2018 season is already off to a bad start in that regard, as several players will be out for the Eagles' opener against the Atlanta Falcons. • QB Carson Wentz: Has this been discussed at all this week, or through the spring and summer? I'm not sure. Anyway, Nick Foles will start, and Nate Sudfeld will be his backup. • WR Alshon Jeffery: Jeffery will reportedly be back closer to Week 3 as he continues to recover from his rotator cuff surgery. In his absence, Mike Wallace and Nelson Agholor will start, and I would expect that the Eagles will employ more two-TE sets than usual. • OT Jordan Mailata: The project of all projects will be inactive for the foreseeable future. • OT/OG Matt Pryor: Pryor is a rookie who could use time to grow. • DE Josh Sweat: Another Eagles rookie project will sit with a strong rotation of defensive ends ahead of him. • OL Chance Warmack: The Eagles will roll with seven offensive linemen. To note, the Eagles only have six inactives because they only have 52 players on the roster. Mack Hollins doesn't count toward the 53, as the team placed him on injured reserve earlier today. • LB Nigel Bradham: Bradham is serving a one-game suspension stemming from his "cabana boy" incident in 2016. He was the Eagles' best linebacker last season, and will be missed against a Falcons offense that has two good running backs in Devonta Freeman and Tevin Coleman. Linebacker Nate Gerry said on Monday that the Eagles' linebacker rotation, which will include himself, Jordan Hicks, and Kamu Grigier-Hill, will be matchup-based. • DT Timmy Jernigan (back): Jernigan will start the season on the NFI list, which is essentially an extension of the PUP list, meaning he'll be out for at least the first six weeks of the season, though it'll likely extend beyond that. Jernigan was very productive early in the season last year, but his play tailed off a bit down the stretch. He'll be replaced in the lineup by a combination of Destiny Vaeao and free agent acquisition Haloti Ngata. • ST Chris Maragos (knee): Maragos is still recovering from a serious knee injury suffered Week 6 last year against the Carolina Panthers. He'll start the season on PUP, so he'll miss at least the first six games. Like Jernigan, it is not anticipated that Maragos will be ready at the conclusion of those six weeks. • TE Richard Rodgers (knee): Rodgers had a good training camp, and looked like he could be a quality third tight end. However, he injured his knee on a touchdown reception from Nate Sudfeld in the preseason, and has been seen walking around the NovaCare Complex in a bulky cast. As a result, the team kept a fourth tight end, Joshua Perkins, at final cutdowns. Rodgers will have to stay on IR for at least eight weeks, after which point the team can decide to use one of their two "return from IR" designations on him at any time. • WR Mack Hollins (groin): Last season as a rookie, Hollins had 16 catches for 226 yards and 1 TD. Hollins had surgery to repair a sports hernia injury at the end of the 2017 season, and he was listed on this week's injury report with a "groin" injury. To note, a sports hernia is a strain or tear of any soft tissue in the lower abdomen or groin area, though Doug Pederson said on Tuesday that Hollins' surgery and his current injury are unrelated. Like with Rodgers above, Hollins will be out at least eight weeks. • OG Ben Garland: Garland is a backup offensive lineman who started against the Eagles in the divisional round of the playoffs last year with Andy Levitre out. Levitre is healthy again, and will play. • CB Isaiah Oliver: Oliver was a second-round pick of the Falcons this year, but he's buried for the time being behind a trio of corners in Marcus Trufant, Robert Alford, and Brian Poole. • CB Blidi Wreh-Wilson: Third-team corner, but obviously, with two corners already out, the Falcons can't afford another corner injury during the game. • S Jordan Richards: The Eagles won't get to pick on ol' Jordan like they did in the Super Bowl. • LS Josh Harris: The Falcons called up LS Jeff Overbaugh from their practice squad. • OT Matt Gono: I have no analysis for Matt Gono. • DT Justin Zimmer: I don't have any analysis for Justin Zimmer either.